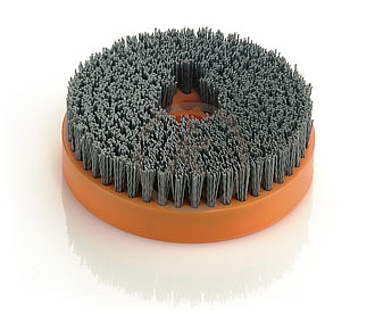 Kullen-Koti disc brushes can be supplied with various fill configurations. For example with compressed face, with narrow or large fill collars, with fill array in particular forms, either with normal vertical bristle bundles or with inclined bundles to all directions. We supply core material according to your application purpose, for example cores made of plastic qualities PP, PA, PE, POM or PVC as well as of wood or different steel and metal types. On request of big quantities it is worth to use moulded plastic cores. Almost all fill material qualities can be used, e.g. natural hairs and bristles, plant fibres, synthetic filaments and wires. We can supply disc brushes matched to your requirements with bore hole, thread or shaft for fitting in the machines.